Hi guys. 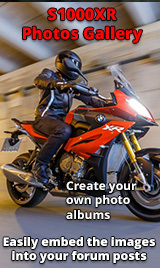 I'm new to this forum and i'm looking at getting an S1000XR. I need your advice on Dynamic ESA. I will be adding the Dynamic Package as an option, but this doesn't include Dynamic ESA. Dynamic ESA is packaged with the Touring package which includes alot of stuff i don't need.......so the question is, is it worth the extra € 1400 for the ESA? Besides the convenience of electronic adjusted preload on the rear suspension, DESA also provides electronic damping on the front suspension. That is it adjusts damping on the fly depending on the road conditions. Without DESA you must manually adjust the front suspension damping to suit your needs. Personally I find the DESA to be a great addition. I can feel it adjust when I'm in the twisties depending on the roughness of the road - it stiffens up some as the roads get bumpier. All good sport bikes have user adjustable suspension - including the XR without DESA. Learning to adjust the suspension properly is another matter. Many riders would just set it in the middle and leave it.